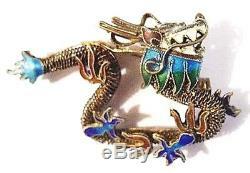 Chinese Sterling Gilt Filigree Enamel DRAGON Pin Vintage Silver Cloisonne Brooch. 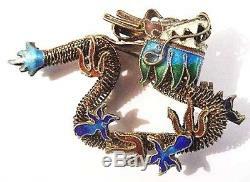 This vintage Chinese sterling vermeil filigree and enamel brooch features a fabulous undulating Dragon. He is highly detailed, from his jagged teeth, sinuous whiskers, beady eyes (and nose) to the careful shading of the enamel. His ferocious mouth is open, revealing his pointy tongue. The curvaceous beast has enamel shapes along the sides of his body that echo that of his tail. The enamel is in wonderful soft, but vibrant, shades of blue, green, red, white and purple. The way the dragon is coiled conveys movement, energy and dramatic tension, as if the reptile were just waiting to spring. With the interesting subject, color combo and shapes, this piece will stand out strikingly when you wear it. Puff the Magic Dragon had nothing on this one! It measures about 2" long by over 1-1/4" tall by 3/8 deep (or thick). It is signed at the base of the pin finding "925" preceded by what could be the letter "B" or the number "8". Sorry - only the "25" shows in the close-up. The brooch is in Very Good vintage condition with dirt, including a whitish substance in the recesses here and there, (perhaps silver polish or maybe flux from when it was made) scratches, including a couple fine lines in the enamel on the back, and only the most minimal wear to the enamel. The pin stem is slightly wobbly but works fine. There are slight inconsistencies in execution that only add to its hand made charm and personality. He is quite fascinating and SO appealing. 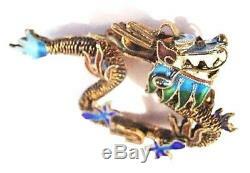 Dramatic and exotic, this fantastic dragon will bring the romance and allure of the Orient to your outfit. 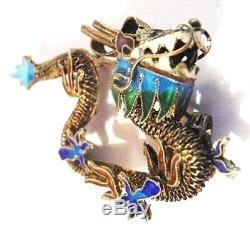 Perfect for collectors of Chinese jewelry, Dragons and of course, brooches. Although I doubt you will want to part with it, this pin would make a terrific gift and will come to you in a gift-box, just in case. This piece will look wonderful on and make a superb addition to your collection. 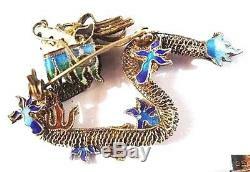 Please see our other listings for more great vintage jewelry. Both methods include gift box. International buyers aware of the rules and expenses of importing into their country are welcome. WE LOVE TO ANSWER QUESTIONS! If you have a complaint, please let us know. It is our highest ambition to deserve 5 Stars. We thank you for your custom! Powered by SixBit's eCommerce Solution. 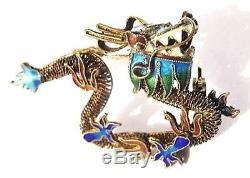 The item "Chinese Sterling Gilt Filigree Enamel DRAGON Pin Vintage Silver Cloisonne Brooch" is in sale since Thursday, July 26, 2018. This item is in the category "Jewelry & Watches\Vintage & Antique Jewelry\Fine\Retro, Vintage 1930s-1980s\Pins, Brooches". The seller is "momandpopcybershop" and is located in Houston, Texas. This item can be shipped worldwide.